IPL 2019 | Will the Real Royal Challengers Bangalore Please Stand up? Year after year, Bangalore have laid out a team which boasts of superstars in every sense of the word. From Chris Gayle, Yuvraj Singh, Brendon McCullum to Virat Kohli and AB de Villiers - RCB have had it all, but they still seem to fall short every season. Since finishing as runners-up in 2016, Bangalore have won just 9 of their last 33 IPL games - that is a staggering statistic for a side which has some of the best names in the business. More than anything else it is the nature of defeats that is hurting Bangalore. They were bundled out for 70 in their tournament opener against Chennai Super Kings and then conceded 187/8 and 231/2 in the following two games against Mumbai Indians and Sunrisers Hyderabad. In the last outing against Rajasthan, Bangalore dropped as many as four chances at crucial junctions of their 159-run defence which dented their chances. They are at the basement of the points table and their net run-rate is floundering at a lowly -1.901. Despite a plethora of talent, an experienced support staff, a captain who is considered among the greatest ever, a strong fan base, why does the script keep repeating for Bangalore? 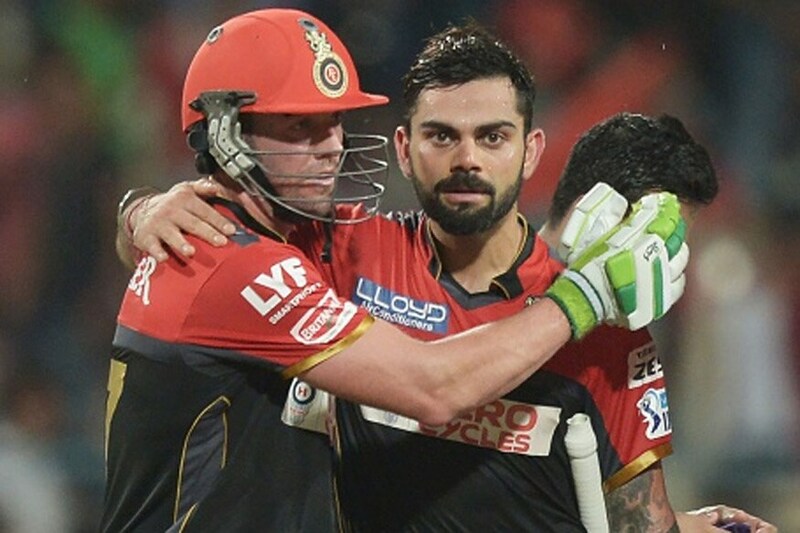 Ask anyone the first names they will want on their all-time T20 eleven, pat will come a reply - de Villiers and Kohli. The duo is undoubtedly one of the fiercest combinations one can ask for in their side. The hard fact though is that individuals can win you a game or two but not the titles. Last year, Kohli was the leading run-scorer for Bangalore with 530 runs and de Villiers was second on the list with 480. The third highest run-scorer was Mandeep Singh with 252 runs, less than half of what Kohli managed. The story in 2017 was similar - Kohli the leading run-scorer with de Villiers third on the runs chart. When the two have fired, Bangalore have the looked every bit of the unbeatable unit but when they fail, like has been the case this season, it rubs onto the whole team negatively. Kohli's scores so far in the tournament read 6, 46, 3, 23. De Villiers sequence is 9, 70*, 1, 13. The only game where Bangalore came close to winning was the one against Mumbai - yes the no-ball one - where they almost chased down 188 only to fall short by 6 runs. De Villiers and Kohli's score in the encounter - 70* & 46. Parthiv Patel so far this year has looked solid at the top but if Bangalore need to stage a comeback, the likes of Shimron Hetmyer, Marcus Stoinis and Moeen Ali will need to come to the party soon. In the first match of the season, Parthiv walked out to open the batting with Virat Kohli. It looked a good move, considering the captain's success while opening for his franchise in the past. For some reason, the next game Parthiv and Hetmyer opened the innings, the third game had Moeen Ali opening the innings while in the fourth outing against Rajasthan, Kohli paired up with Parthiv again. It is no secret that runs scored in the Power Play in T20 games are most crucial but an unsettled opening pair has denied Bangalore any momentum first up. His ever-changing opening partner also means that Parthiv has not been able to build a rapport which is so important up front. In the last game against Rajasthan, Kohli and Parthiv added 49 runs for the first wicket, but having not batted enough there were times when the duo missed out on opportunities to get some quick singles that someone like Jonny Bairstow and David Warner, who have a good understanding might have converted. Kohli, despite the slightly weakened middle-order, is an absolute necessity at the top for Bangalore. His bumper season back in 2016 where he scored 973 runs in 16 games were all while opening and if he can somehow get that flow going, who knows there might still be an opening left for RCB. Yuzvendra Chahal is the leading wicket-taker so far in the IPL with nine wickets in four games. He has looked lethal with his guile and has used the variations to good effect all through. But, there has been no second spinner in the side to create the same impact. Moeen hasn't looked threatening at all and on surfaces where the ball has taken turn from the outset, not having a proper spinner to back Chahal has hurt Bangalore bad. Factor this, in the first game against Chennai at MA Chidambaram Stadium, the hosts went with three frontline spinners and had Kedar Jadhav and Suresh Raina too if needed. Bangalore had Chahal and Moeen. Despite being bowled out for just 70, RCB still pushed Chennai to the 18th over in the chase with Chahal returning figures of 4-1-6-1. Who knows if they had a frontline spinner in their armoury, there were chances they could have defended 70! The options that Bangalore have in the squad are Washington Sundar and Pawan Negi. With the surfaces likely to get drier and take that much more turn as peak summer sets in, Kohli should look at giving the likes of Sundar or Negi a shot for a few matches. Another reason behind Bangalore's below-par show so far this tournament has been the indifferent performance of the pacers. Both Umesh Yadav and Mohammed Siraj have looked lacklustre at the top and have leaked runs in the backend too. While Umesh has taken just two wickets in the four outings, going at an economy of 8.28, Siraj has been marginally better with four wickets at an economy of 7.57. Add to that Umesh spilt a simple chance of Steve Smith in the dying moments of Tuesday's game. Bangalore have the likes of Nathan Coulter-Nile and Tim Southee sitting in the dug out. Both bowlers have been in red-hot form lately and Kohli has to find a way to get either of them or in an ideal scenario both in the playing eleven. Short answer - in other IPL teams. Karun Nair (Kings XI Punjab), KL Rahul (Kings XI Punjab), Mayank Agarwal (Kings XI Punjab), Shreyas Gopal (Rajasthan Royals), Stuart Binny (Rajasthan Royals), Prasidh Krishna (Kolkata Knight Riders), K Gowtham (Rajasthan Royals), KC Cariappa (Kolkata Knight Riders), Manish Pandey (Sunrisers Hyderabad). Add to this Vinay Kumar and Jagadeesha Suchith who went unsold at this year's auctions and we have a full XI of Karnataka players that are either playing for other IPL sides or were not picked at the auctions. Karnataka are the current Syed Mushtaq Ali T20 champions and have been one of the better teams in the domestic circuit. But there are hardly any local players in the RCB side. The only Karnataka lad in the team currently is 18-year-old Devdutt Padikkal, who is unlikely to get a game. Which begs the question. Why can't the RCB scouts hone home-grown talent? Prasidh, Kolkata's spearhead was picked up from one of the nets sessions he was called for by the franchise. Suchith who played two seasons for Mumbai in 2015 and 2016 was awarded a contract after his stellar show at the Karnataka Premier League. There is no dearth of talent in Karnataka and RCB should try and get some of the local energy into the mix. *This article was written after RCB's first 4 IPL 2019 games.